With Valentine’s Day just past, I thought it the perfect time to launch a new blog series that I’ve had brewing for awhile. 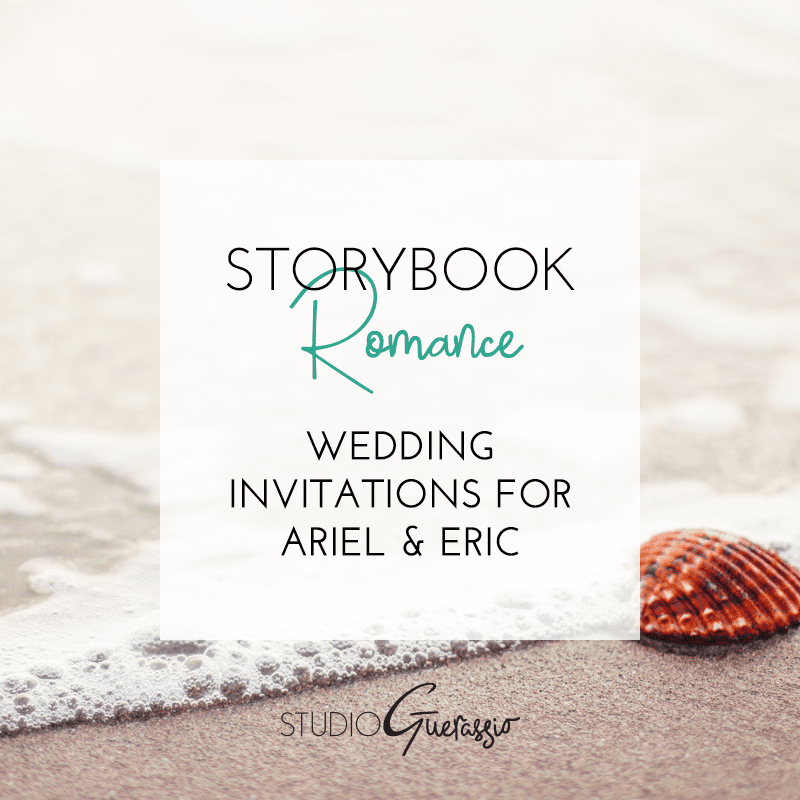 Introducing Storybook Romance, where I design wedding invitations for famous fairytale and literary couples, with my own modern twist. I’ve been wanting to flex my invitation design muscles a bit more, and when I was gifted a Silhouette Cameo cutting machine for Christmas, I knew exactly how to put it through its paces. 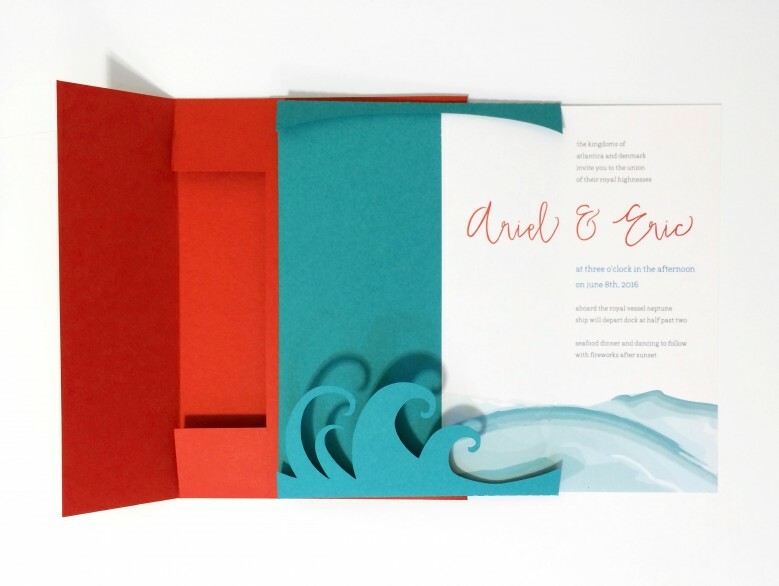 A wedding invitation suite for Ariel & Eric from The Little Mermaid. 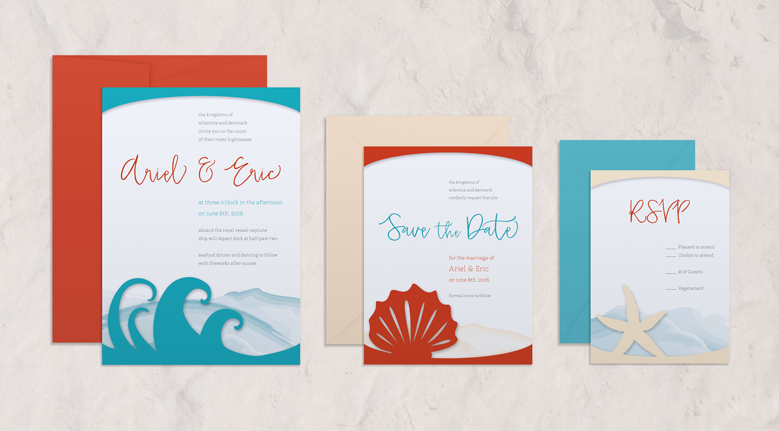 This is what I picture their invitations to look like if they were having a modern beach wedding (or wedding at sea). Simple and stylized with bold colors. I wanted a nice blend of land and sea, for obvious reasons. The red for Ariel’s hair, the blue for the ocean, and the cream for sand. I stuck with informal type treatments because despite being royals, Ariel & Eric are not sticklers for tradition or doing what’s expected. 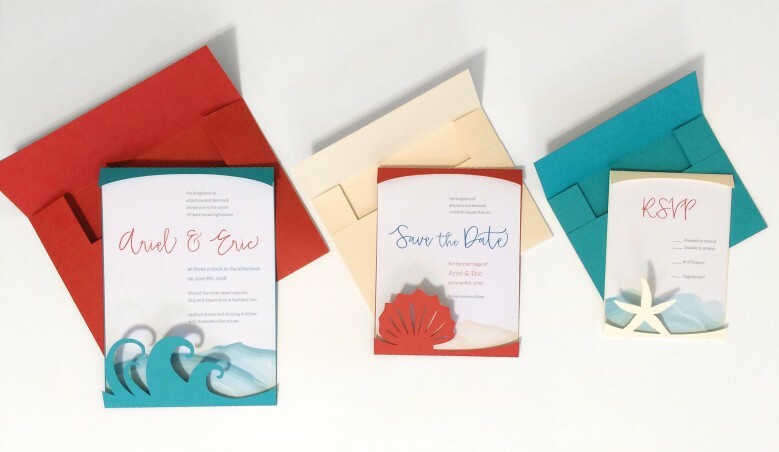 The main invite is A7 size, the save the date card is A2, and the RSVP card is A1. 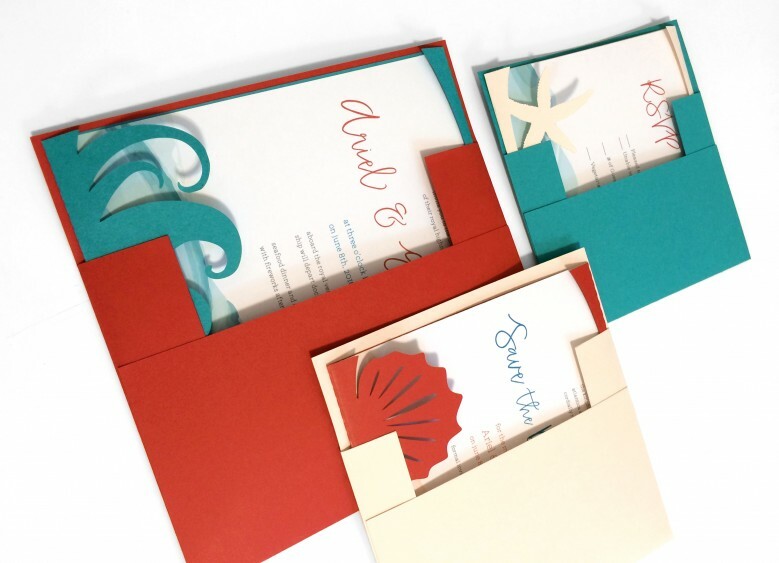 All feature a fold-over holder in a solid color, with a distinctive shape cut out to overlay the enclosed cards. The cards themselves are printed on plain white card stock, and a feature faux watercolor treatment to evoke water and sand. You simply slide the card into its holder, and then into the coordinating envelope. I printed the cards on my home printer, and used my Silhouette Cameo machine to make the holders and envelopes. I started with this couple because I had a clear vision for what I wanted to create. The Little Mermaid, however, is not actually my favorite fairytale. Stay tuned for the next installment of Storybook Romance to see which one is! Please note these are a personal creative project, not samples of items for sale or reproduction. 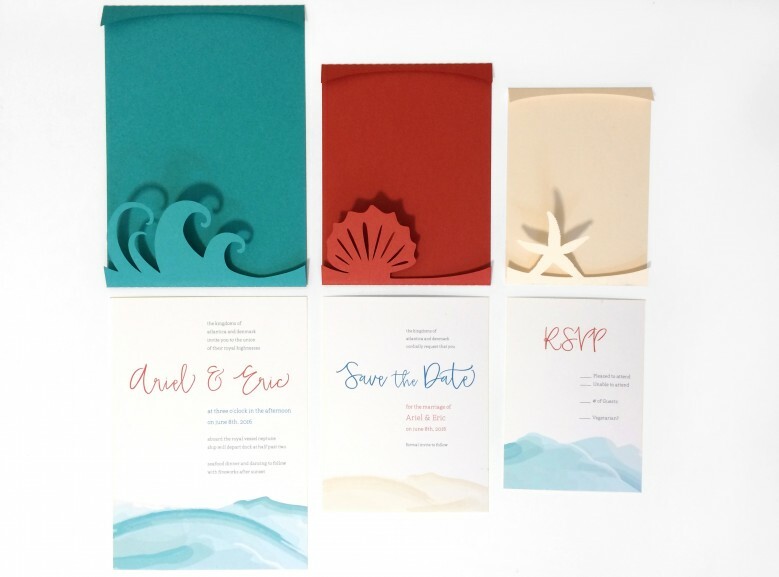 What do you think Ariel & Eric’s modern day wedding invitations would look like? This is SO cute! The Little Mermaid is my favourite Disney film so this put a smile on my face – it’s so creative, and perfect for Ariel and Eric!